High Capacity Compatible Epson T24xl T2431 Black ink cartridge. Replaces Epson 24XL Elephant Cartridges. High Capacity Compatible Epson T24xl T2432 Cyan ink cartridge. High Capacity Compatible Epson T24xl T2433 Magenta ink cartridge. High Capacity Compatible Epson T24xl T2434 Yellow ink cartridge. High Capacity Compatible Epson T24xl T2435 Light Cyan ink cartridge. High Capacity Compatible Epson T24xl T2436 Light Magenta ink cartridge. Epson XP-960 is a 3-in-one device that offers a printer, copier and a scanner for home use. Photo printing, A3 printing capability, wireless connectivity, LCD touchscreen panel and ability to print on a wide range of media are the primary highlights of the machine. The small-in-one machine weighs 8.7 kg and measures 479‎ x 356 x 148 mm (Width x Depth x Height). It features a large 10.9 cm LCD touchscreen that helps you in picture preview and navigation. The text and photo quality of the printer meets the requirements of home users. The printing speed for black and white goes up to 8.5 ppm and for colour 8 ppm. The device is integrated with a six-ink configuration of Epson XP-960 ink cartridges that end up with distinct colours on printed images. It is able to print sheets up to a tabloid-size paper i.e. A3 size paper. Besides, it allows printing directly from a memory card and camera (through PictBridge). Printing via Cloud and scanning to a mobile phone is also possible. Availability of WiFi and WiFi Direct adds flexibility to print and scan from anywhere. The printer is compatible with Windows and Mac OS. 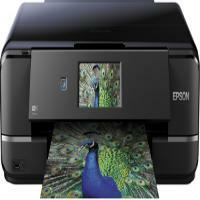 Epson XP-960 is able to print on A3 size sheets that is one of the rare features available in all-in-one devices. Looking at all the features it is a good choice for home users. What to do if the Epson printer creates noise after ink cartridge installation? When you are installing the Epson XP-960 ink cartridge for the first time, ensure that the printer’s print head is charged. Before turning off the printer, wait until charging gets finished, otherwise, it may charge improperly and might use excess ink next time when you turn it on. Your printer will finish charging the printhead when the power light stops flashing. If the Epson XP-960 printer’s printhead has stopped moving or making noise, and the charging process is not finished even after 5 minutes, just turn the printer off. Turn it on again and check if charging is still in progress. If it is still charging contact the support to further assist you. How can we fix the issue of faint printout or print with gaps? Implement a nozzle check to verify that the print head nozzles are clogged or not. Clean the print head, if required. If the Epson XP-960 ink cartridges are old and require replacement, then take the necessary action. Ensure that the paper type settings match with the type of paper loaded in the printer. Check that the paper is not moist, crushed, pale, or loaded in the wrong manner. Align the print head and clean the paper path. Note: If the printer creates noise when It is not being used for a while, it simply means that your printer is executing a regular maintenance procedure which is common. In case the above steps are not helpful for fixing your issue, contact the nearby printer service center. Q. What should I do if the print quality is not as expected and my Epson XP-960 printer is printing smudged or distorted printouts? A. If the print results are not appropriate, it might be possible that your printer is low on ink or has dirty print heads that need cleaning. Also, while printing on low-quality paper the printer might experience smudges, uneven or faded text, that runs off the edges of the paper. Check for the problem and perform necessary operation. Q. What if I use compatible ink cartridges instead of the original ones? Will this void my printer’s print warranty? A. You can definitely purchase compatible Epson XP-960 ink cartridges for your printer. The cartridges you buy must be ISO certified and tested to quality standards. Using compatible ink won’t void your printer’s print quality at all. Q. I ordered ink cartridges from your website, but they are leaking. What policy do I need to follow for returning a faulty item? A. We are sorry for the inconvenience caused. If the product is damaged during transit immediately contact us giving the details of the damage incurred to the parcel. Also, if the item is faulty simply contact us at 048 30833221 or email us on info@printerinkcartridges.ie. We'll give you a replacement or a refund once the item has been returned to us and tested. Q. What is the expected delivery date of the Epson XP-960 ink cartridges, if I order them from your site? A. We deliver nationwide through our courier partners DPD and GLS Couriers and guarantee the delivery for your items within 1 - 2 delivery day basis. Approximately 96% of our orders received before 1 pm daily are dispatched on the same day. However, you might experience some delay in the order due to a rural location or the courier's network distribution. Q. Will I experience the same quality printouts using the compatible ones as I used to get from the original brand cartridges? A. We at Printer Ink Cartridges guaranty you that, you will experience equivalent print quality using the compatible Epson XP-960 ink cartridges as you have experienced using the original brand. The cartridges supplied must be passed through various quality tests and cost low in price compared to the cost of the original brand.